CINCH men’s jackets feature classic western styling and second-to-none quality. Just like our CINCH jeans, CINCH outerwear is built to withstand the test of time. Choose from a variety of styles in fabrics and weights such as denim, down, leather, canvas and bonded fleece. 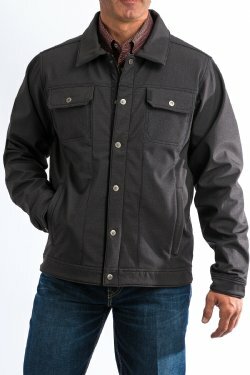 In addition, some CINCH jackets are equipped with a durable water resistant (DWR) finish to provide extra protection from the elements. Most styles available in sizes XS-XXL, and some available in 3XL and 4XL. For all types of weather and activities, CINCH outerwear has you covered. Find the style that’s perfect for you below.